We finally wrapped up our unit on the Middle Ages! The students did a phenomenal job on their unit test. I find that this is always the best test of the year and I truly believe it is because of the lap books that we create. It is constant reinforcement of the material that we learn – we discover information through a PowerPoint, we create a mini book based on that information, and we review the information again when we put our lap book together. They love it and it creates a wonderful keepsake for this fun unit. 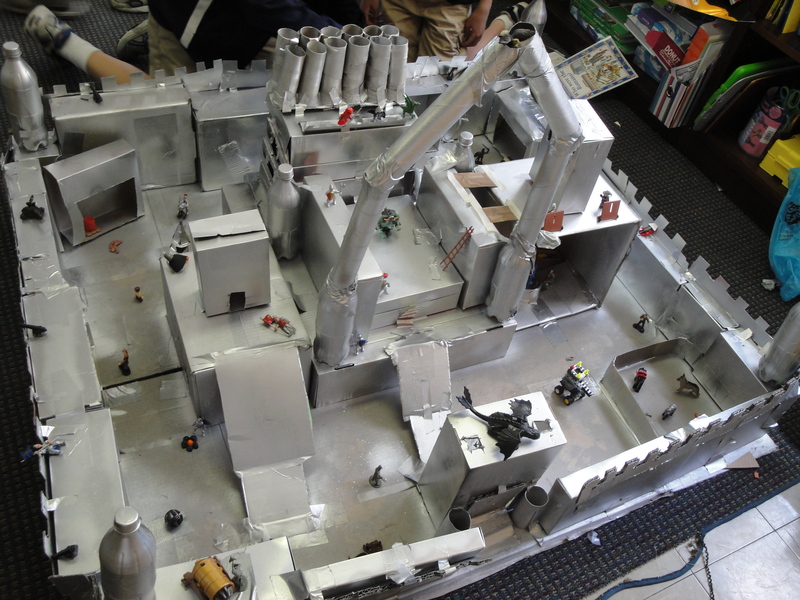 Last week a parent came in to help me spray paint the castles the students built. We opened up all of the windows, put tarps under the castles, and draped sheets over the computers to keep them spray paint free. They turned out GREAT! 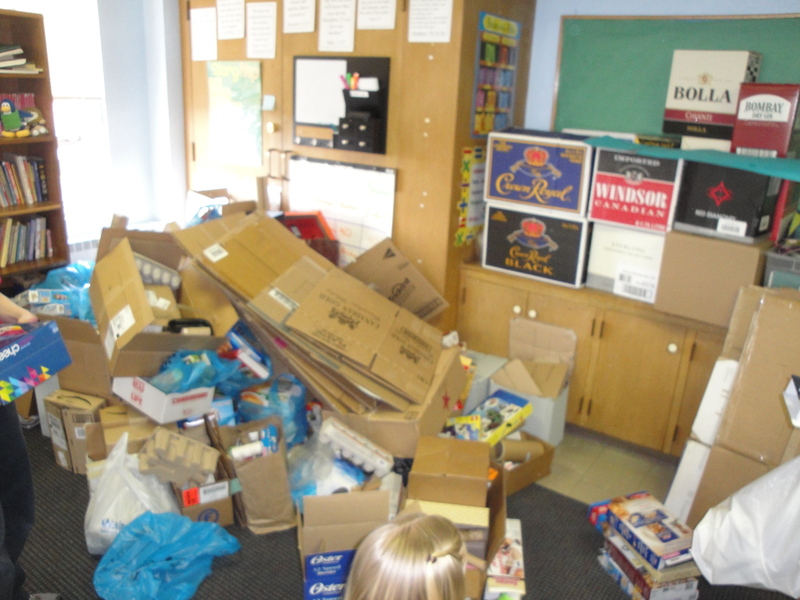 It took us 10 cans – way more than we originally thought – but they look awesome and the class was so excited about them. 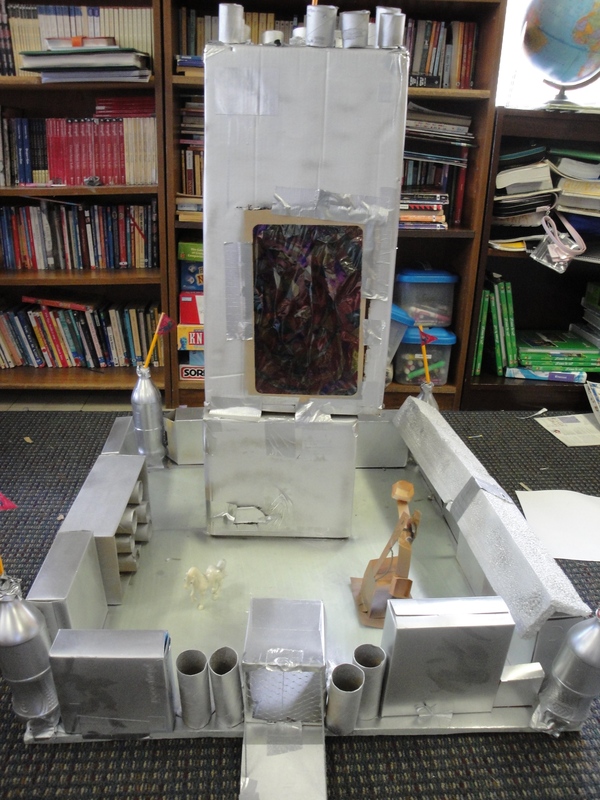 The next day the students brought in Lego and Playmobile figures to “decorate” their castles with – we have lots of knights, dragons, and kings and queens. Another exciting activity we did was one that a classroom parent came up with – banana jousting! 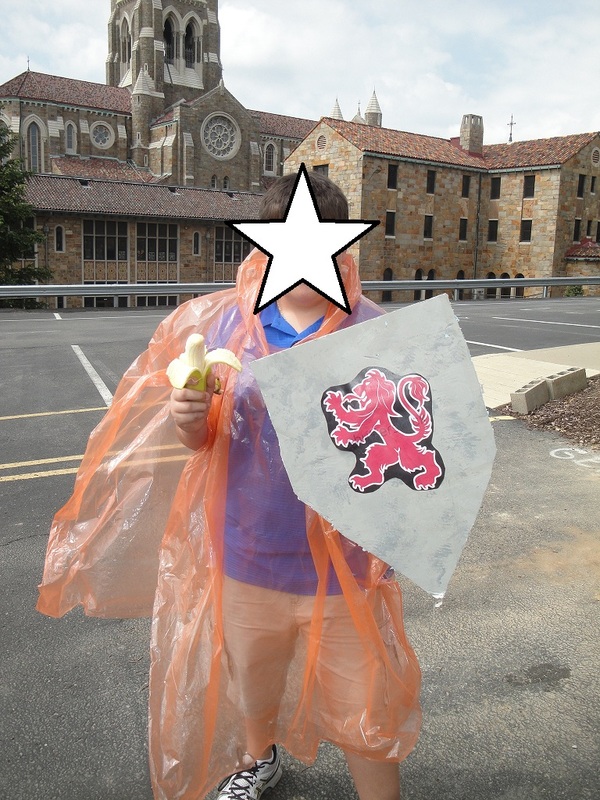 The class was split into two teams and the current “jouster” on each team was given a poncho as armor, a shield made out of thick foam core, and a banana. The students would take turns making a pass at the other knight, trying to touch their poncho with the banana. 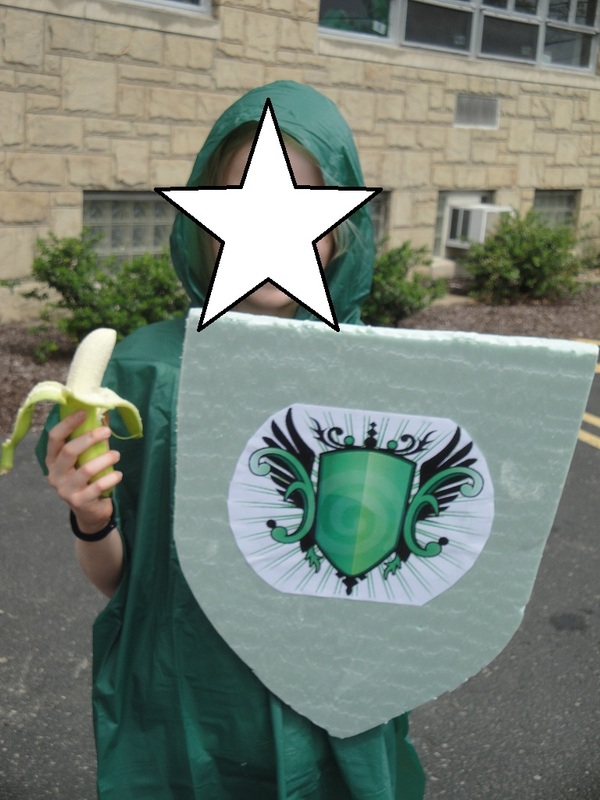 One point was awarded for banana being smeared on the poncho and one point was awarded to whichever knight had the longer banana after the round was over. It was an enjoyable activity that the kids had a blast with!! 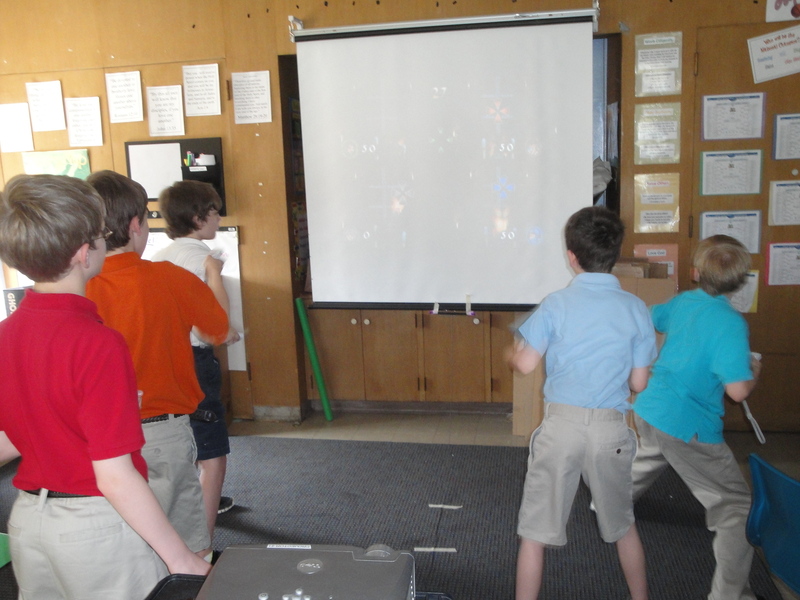 To close out our unit, we enjoyed a fun medieval party. 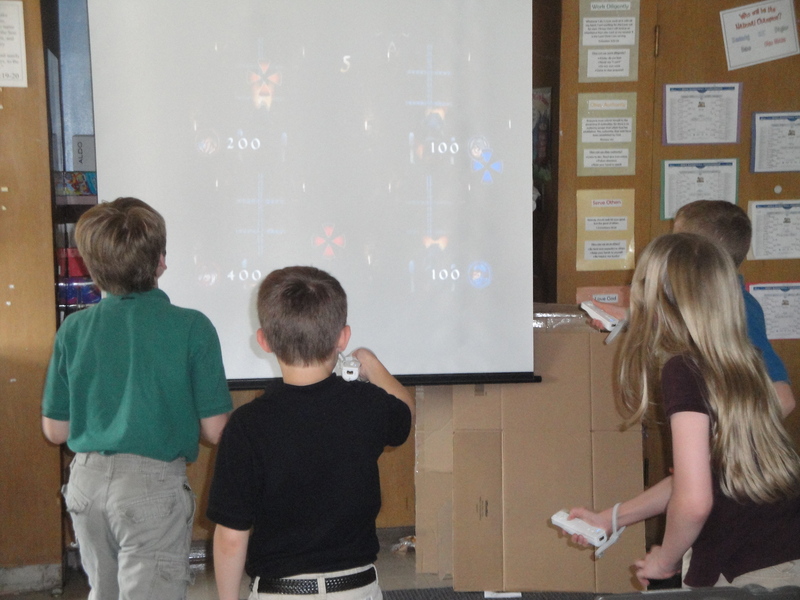 I set up three stations throughout the room – coloring, computers, and Wii. For the Wii station, I brought in my Wii and borrowed Medieval Games (http://www.amazon.com/Medieval-Games-Nintendo-Wii/dp/B001S86ISG/ref=sr_1_1?ie=UTF8&qid=1337188714&sr=8-1_) for the Wii from a parent. 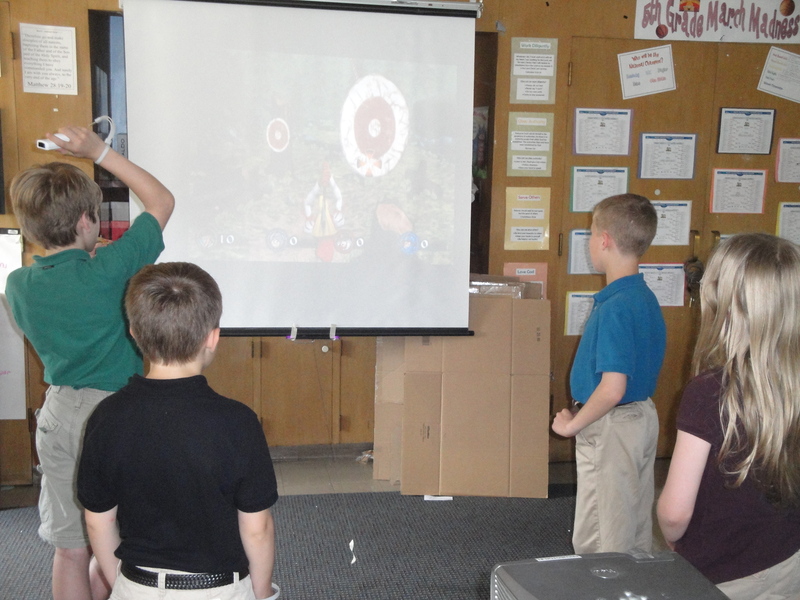 This is a fun game, especially with four players, that allows the students to joust, sword fight, compete in archery tournaments, and much more. The kids of course loved it and did really well! For the computer station, I created an internet scavenger hunt based on a website I found with interesting facts about medieval times. The students had to answer questions based on what they found on the website. Finally I copied pictures of religious stained glass windows from a coloring book I have. The students used marker to color the stained glass and we rubbed vegetable oil on the other side to make it transparent – they looked awesome! I also had parents send in some yummy food to enjoy, such as cheese and pepperoni, grapes and watermelons on sword-shaped toothpicks, and pretzels. One parent even made some mead for the kids to try! 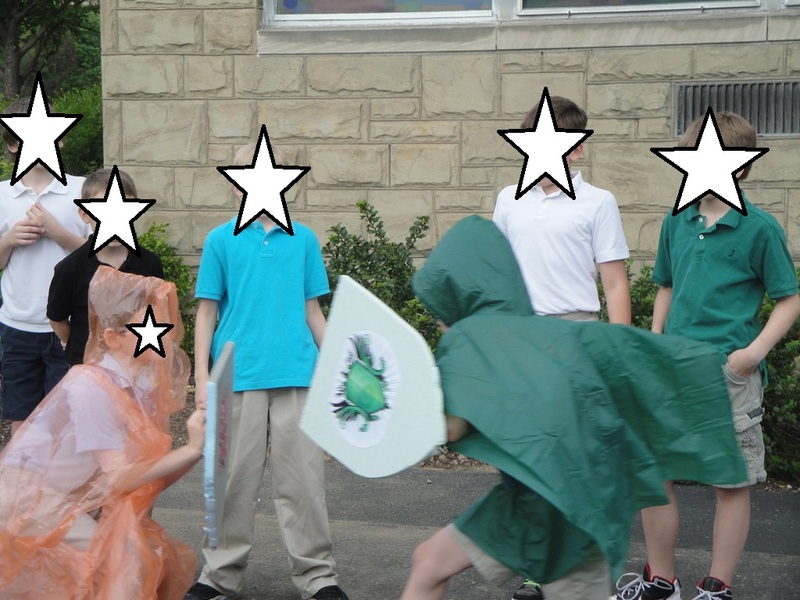 Overall, our medieval unit was tons of fun and it’s always sad to see it draw to a close. My goal was for the class to come away with a deeper understanding of this time period, including the role religion played, the importance of feudalism, and how our world has changed since then. I am already looking forward to next year!! Based on this picture, and knowing that we are studying the Middle Ages, can you guess what our latest classroom endeavor is?? 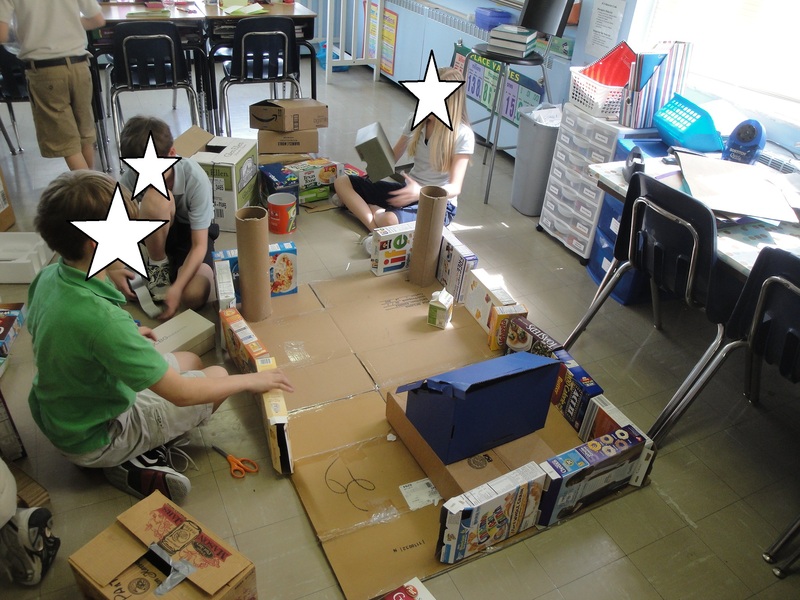 If you guessed building cardboard castles, you were RIGHT!! 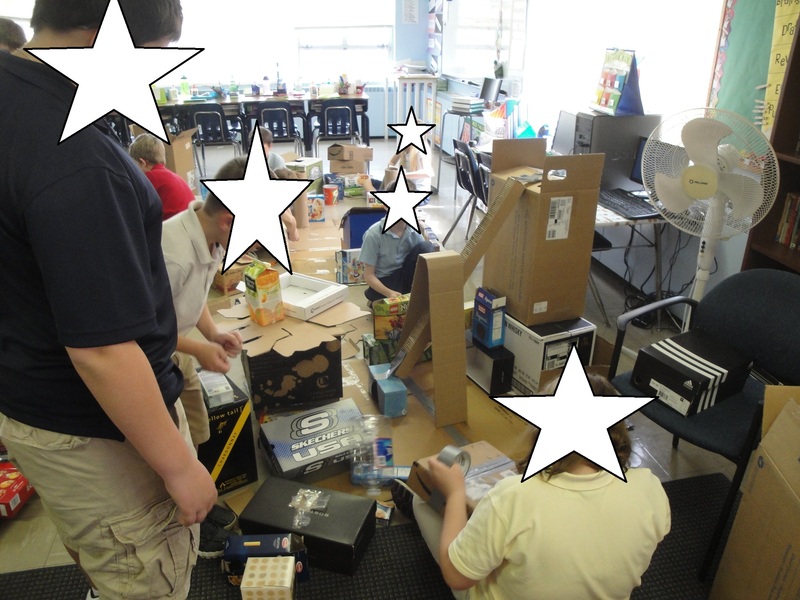 About the middle of March, I began collecting cardboard boxes of all sizes, as well as egg cartons, pop bottles, applesauce cups, and other good “building” supplies. The above picture is the pile as of the middle of April! Good thing I can handle clutter – if I was a neat freak, this would be a major problem 🙂 The closet to the right of this picture was completely full of boxes too! Needless to say, we have more than enough boxes. Last week I split the kids into 4 groups. 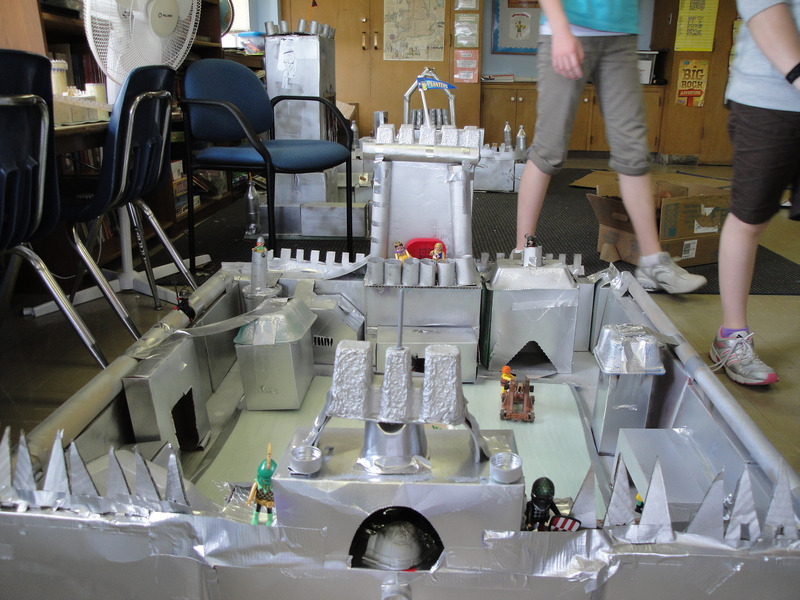 Each group was given 2 rolls of duck tape, a large cardboard box flattened out to use as the base, and a few guidelines of parts of a castle that must be included (ex: wall, drawbridge, keep, towers). 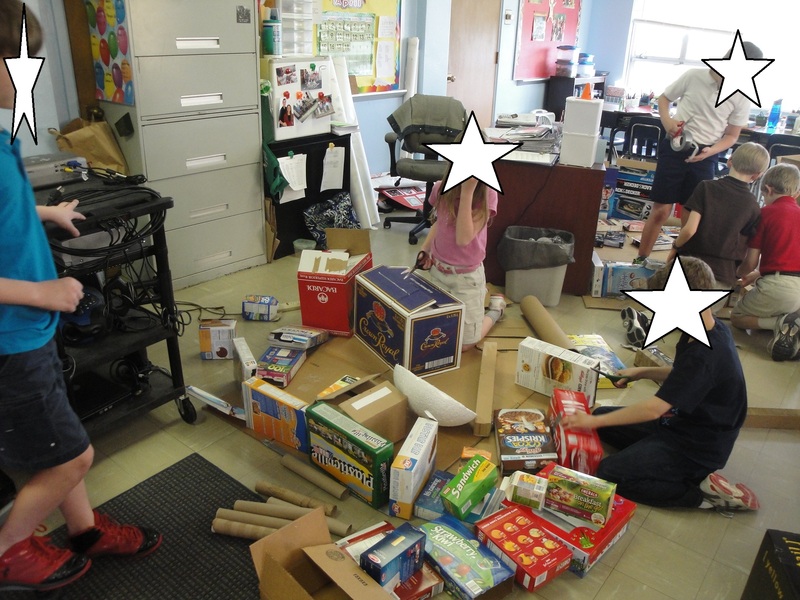 We went around group by group picking boxes from the pile until they had a good amount to start with. Once they began working, they were allowed to send one person from their group at a time back to the pile of boxes to get any more that they needed. Our pile has been about cut in half, but we still have quite a few left! Once they are completely done, I will spray paint them gray/silver to look more polished and more castle-like, and then they will be permitted to bring in “medieval-type” characters, such as Lego people or Playmobile figures, to finish it off. They always turn out great and I am excited to see this year’s finished products! Do you study the Middle Ages? 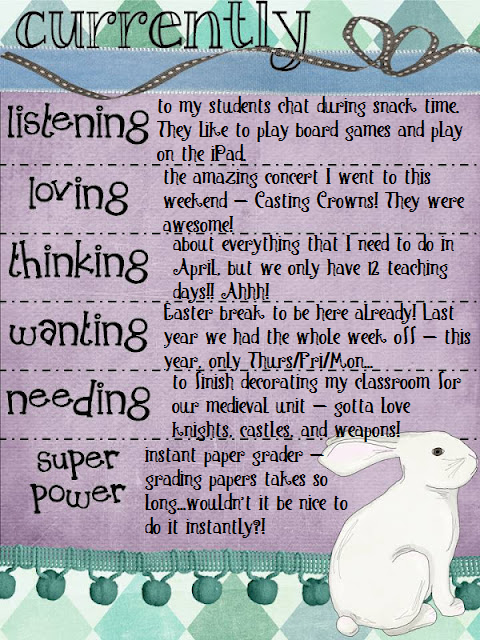 I’d love to hear about some of the fun things you do with your class!! For now I’m linking up with Farley over at http://ohboy3rdgrade.blogspot.com/ – be sure to check out everyone’s blogs. There are SO many to go through – I wish I had a free day to do so! Oh wait…I won’t until Thursday because our break doesn’t start until then. Boo. Wouldn’t it be nice to just push a button and have all of your papers graded? And I mean, all papers – not just math worksheets or English pages, but writing assignments and journaling work! This consumes so much time, I can only imagine how wonderful an instant paper grader button would be!